The absolute french family meal. 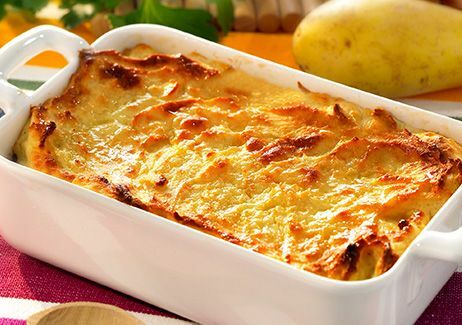 A french dish very similar to the Cottage Pie (Beef meat) or the Sheperd’s Pie (Lamb meat). Traditionally the Hachis Parmentier was made of leftover meat blended together. Nowadays we tend to use minced Beef to cook this delicious family meal. Mince the garlic and the onion. Cook the grounded beef with the minced onion and garlic. Boil the potatoes for 20 min. Skin the potatoes and mash them in a recipient. Add to the mashed potatoes the grated cheese, egg yolks and double cream. Add a pinch of salt and pepper. Spread the meat in a dish then spread the mash potatoes on top of it. Cook in the oven to 210°C for 20 min until the top has become golden brown.